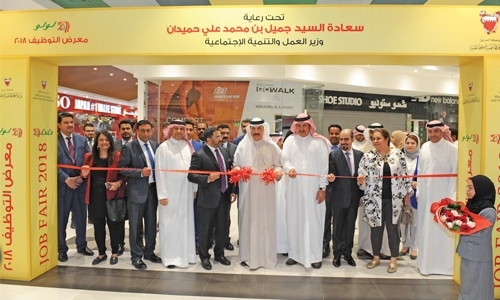 Manama : Under the patronage of the Minister of Labour & Social Development, Jameel Humaidan, LuLu Hypermarket launched its 2nd Job Fair at the Ramli Mall yesterday. This year, 24 companies have taken part in the LuLu Job Fair, which is also the only one to be organised by a private sector company for different organisations. The event served as an HR marketplace and recruitment centre of talented and educated Bahraini nationals. More than 2000 Bahrainis attend preliminary screening and interviews to sign up for 1000 jobs in sectors including retail, automobile, Medicare and security industry. Lulu Hypermarket itself has 500 vacancies. The jobs on offer ranged from shop clerks and security guards to sales executives and doctors as well as key backroom teams such as mechanics and electricians and merchandisers and sales supervisors. Participating companies included Unilever, Nestle, Lulu International Exchange, AJM Kooheji Group, Mohammed Fakhroo & Bros., Secure-Me, Al Hilal Hospital, Bin Hindi, Malabar Gold & Diamonds, RedTag, The Nine Training Center, G4S, Jawad Business Group, Jasmi’s, Kewalram, YYT Food Corporation, Coca-Cola, BMMI, Apparel, ISMCO, Eagle Security & Safety and Ahmadi Industries. Speaking on the occasion, Minister, Jameel Al Humaidan praised the Lulu Group for the initiative and said, “New entrants bring fresh ideas and energy to the workplace and investing in them is a way to secure progress for the future. The minister also congratulated LuLu Hypermarket for over 35% of Bahrainisation levels in its Bahrain operation. Twenty LuLu staff who have served for 10 years were also honoured at the inauguration by the Minister for their service.